Optical Crystal Lightbulb, 6.5cm height, Mounted on Onyx-Black Crystal Base. A bright idea for rewarding a bright spark. This fun award is a crystal light bulb with the element sub surface engraved inside making it very lifelike. Mounted on an onyx-black crystal base which is ideal for engraving your badge, message or logo. 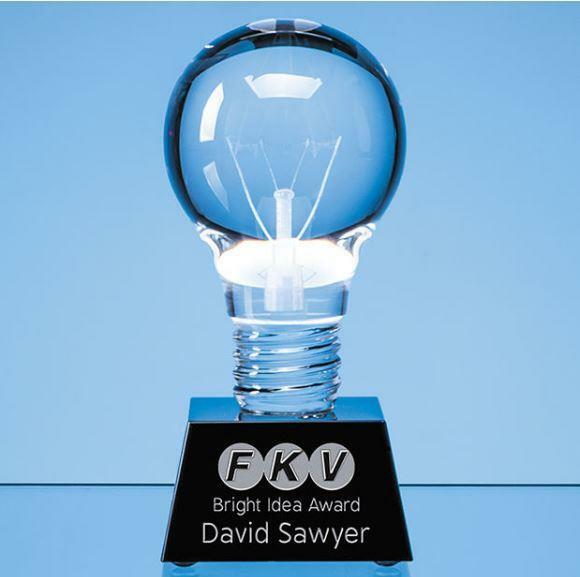 The lightbulb award comes in its own satin lined presentation box. We always send email proofs for you approval before we engrave.